Common Cause in Wisconsin Notched A Reform Win This Week! Reform victories, as most of you know, have been few and far between in Wisconsin since Scott Walker and a big, anti-reform majority in the Legislature seized power in 2010. So when we score one, however small, it is sweet. On Tuesday, we issued a statewide alert and release calling out State Senator Alberta Darling (R-River Hills), the Co-Chair of the budget-crafting Joint Committee on Finance (JCF) and her Assembly counterpart, State Representative John Nygren (R-Marinette), for scheduling a fundraising event (for Darling) in Madison while JCF was still writing the state budget. The Wisconsin State Journal Wednesday morning joined our call for Senator Darling to cancel her campaign cash lobbyist shakedown Thursday in Madison. The Capital Times also weighed in, and the Milwaukee Journal Sentinel did as well. The Beloit Daily News urged the Senator to "wait until later to vacuum cash." In addition, we generated numerous calls and e-mails into Darling's office telling her to cancel. Wednesday afternoon, Darling relented and cancelled the event. So, we won! And in the process, we excited some reform-minded citizens like us and gave us hope that collective action and attracting favorable media attention can still change minds and cause discomfort for elected officials in this state. Many of you helped in this effort by contacting Senator Darling. And she heard you. Thank you! Wisconsin State Senator Alberta Darling (R-River Hills) has been in the Wisconsin Legislature for a quarter of a century and a State Senator since 1993. She is currently the Senate Co-Chair of the budget-crafting "powerful" Joint Committee on Finance (JCF), which is finishing up work on the 2015-2017 biennium budget submitted earlier this year by Governor Scott Walker. That budget proposal, which is fraught with controversy and opposition – even by many Republicans – is more a document designed to appeal to far right wing primary voters in Iowa and South Carolina than it is for Wisconsinites, as Walker traverses around the country in a highly questionable quest to be President of the United States. Everyone in Wisconsin knows and acknowledges this. But Darling, who, in the distant past, has demonstrated at least some common sense about what is appropriate and acceptable to avoid corruption, or the appearance of corruption in Wisconsin, has apparently abandoned any such former ethical scruples and is utilizing her position as Co-Chair of the JCF to shake down lobbyists and others with an interest in the budget process for $1,000 (to be a "host") or, at least $500 (to get in the door), this Thursday evening at 5:30 PM at The Madison Club, a block from the State Capitol, just as the JCF is making final decisions on the state budget. And to add insult to injury, the Republican Assembly Co-Chair of the JCF, State Rep, John Nygren (R-Marinette), will be there on Thursday as well to add increased pressure for special interest lobbyists to open their checkbooks to pay tribute to Darling. Really Alberta Darling and John Nygren? Is this what the Wisconsin budget process has become to you now? Those who pony up and attend this fundraiser will be able to plea for last minute changes by the JCF in the budget to protect, or to try to obliterate something, in order to preserve their own special interest in that document before it is sent to the Republican Caucuses in the State Senate and Assembly. The message Darling is sending is obvious. Pay up on Thursday and you may still have her ear. If you don't, then your ability to influence changes will be diminished. How else can any reasonable person interpret the timing of this "reception"? Darling should stop this event from proceeding immediately and we call upon her to do so. Contact Alberta Darling and tell her to cancel her special interest shakedown at the Madison Club on Thursday night by calling her office, and/or by emailing her. She knows better than to do this (or should). Tell her you resent her trying to use a bad budget to raise money for her next campaign for re-election and that the citizens of Wisconsin deserve better than this. Other states (including Minnesota, of course) prohibit the practice of legislators conducting fundraising events like this one while their state budgets are being formulated. The conflict of interest in allowing these types of events to occur is obvious and damaging and feeds into the public perception that state government is for sale. 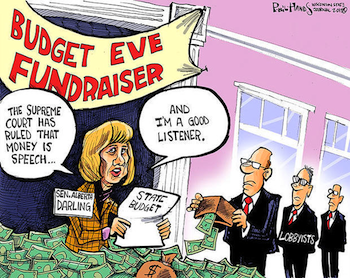 CC/WI has long advocated for ending all campaign fundraising while the state budget is in play. This should include all state legislators and all statewide elected officials including the Governor. The most effective and far-reaching measure to accomplish this was a Republican proposal, Assembly Bill 42, which CC/WI strongly supported, that was introduced in 2009 by then State Representative Mark Gottlieb (R-Point Washington), who currently serves as the Secretary of the Department of Transportation in the Walker Administration. And guess who supported and co-sponsored the Gottleib legislation to ban campaign fundraising during consideration of the budget just six years ago? Why it's none other than State Representative John Nygren, who, unless he comes to his senses before Thursday evening, will be helping Alberta Darling shake down lobbyists for campaign cash in the midst of the budget process. Why was it not okay to have events like this six years ago, but now it is, Mr. Nygren? The answer, of course, is that it has never been okay. Darling, Nygren and every member of the Wisconsin Legislature know this. They just hoped you wouldn't notice.